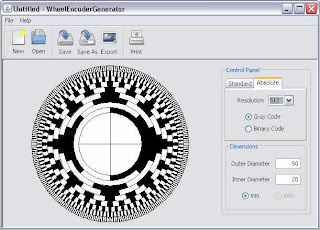 Announcing a full-featured, cross-platform, Java-based wheel encoder generator application for all us DIY roboticist types to print our own encoder wheels (as I did on Data Bus). Flexibility. 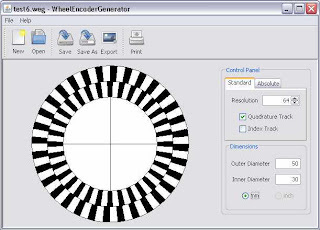 The application will create incremental encoder discs (below) of any diameter with or without quadrature and index tracks; it'll also make absolute encoder discs (above) of any size using either binary or gray code. Speed. It instantly displays a preview of your encoder disc as you make changes. The interface is streamlined to put all the configuration a few clicks and keystrokes away. Toolbar buttons and accelerator keys speed operation. Convenience. The window and preview image are resizeable so you can get a giant preview image if you want. The interface is simple and (I hope) intuitive. This is an incremental encoder with quadrature. Save Your Work. You can save, load and print encoder patterns. You can export them as images. High Resolution. Encoder resolution is theoretically limited only by the dpi resolution of your printer but the code enforces some (arbitrary) limits: 4096-positions, 12 tracks, 0.088° resolution for absolute encoders and incremental encoders with 0.1° resolution. Cross Platform. The app runs with native look and feel on Windows and Mac OS X. It should run fine on anything with a JVM.